ACP-ASIM Bioterrorism Resources - Information for internists, patients, and medical institutions provided by the American College of Physicians-American Society of Internal Medicine (ACP-ASIM). Anthrax - CDC on anthrax, an acute infectious disease caused by the spore-forming bacterium Bacillus anthracis. Anthrax Vaccine Immunization Program (AVIP) - The official U.S. Department of Defense (DoD) site. Source for information about anthrax - the disease, the threat, the safety and effectiveness of the vaccine, and the implementation of the Anthrax Vaccine Immunization Program. Approved Gas Masks - Specializes in the sale of government and military-grade gas mask gear, protective suits, potassium iodide, and all domestic preparedness supplies. Biological and Chemical Terrorism: Strategic Plan for Preparedness and Response - Recommendations of the U.S. Center for Disease Control (CDC) Planning Workgroup. Published April 21, 2001. Biological and Toxin Weapons Convention (BTWC) Website - The purpose of this site, administered by the Department of Peace Studies of the University of Bradford, is to provide accurate, up-to-date information about the BTWC. The information provided is intended to be both comprehensive and objective; it includes the Convention, the Final Declarations of the successive Review Conferences together with other documentation for the Review Conferences as well as information on the ongoing efforts to strengthen the regime. Biological Warfare - The notorious report prepared by George Merck for the Secreary of War on 03 Jan 1945 [aka The Merck Report]. 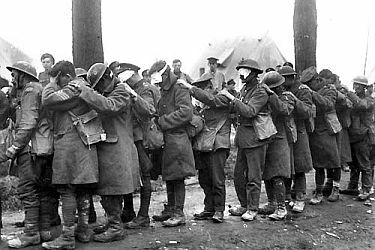 Biological Warfare - Wikipedia entry. Biological Warfare and Terrorism: The Military and Public Health Response (6-part video) - Concerns medical management of biological agent casualties on the battlefield and domestically. Biological Weapons Proliferation - June 9, 2000 report published by the Canadian Security Intelligence Service. Biological and Chemical Weapons - Federation of American Scientists resource for biosecurity policy, bioterrorism information, and biodefense research. Biomedical Advanced Research and Development Authority (BARDA) - BARDA develops and procures neededmedical countermeasures (MCMs), including vaccines, therapeutics, diagnostics, and non-pharmaceutical countermeasures, against a broad array of public health threats, whether natural or intentional in origin. On October 4, 2011, BARDA issued the BARDA Strategic Plan 2011-2016, which articulates the guiding principles, goals, and strategies it will implement to enhance the capability of the U.S. government to develop MCMs to these and other natural and intentional threats to public health. Bioterrorism Articles - Archived by the Journal of the American Medical Association (JAMA), including articles on anthrax, smallpox, botulinum toxin, plague, tularemia, ebola, and brucella. CBRN Respirator Standards Development - The National Institute for Occupational Safety and Health (NIOSH), along with the U.S. Army Soldier Biological and Chemical Command (SBCCOM), and the National Institute for Standards and Technology (NIST) are working to develop appropriate standards and test procedures for all classes of respirators that will provide respiratory protection from Chemical, Biological, Radiological, and Nuclear (CBRN) agent inhalation hazards. CDC Public Health Emergency Preparedness & Response Site - Information on terrorism and public health. Provided by the U.S. Centers for Disease Control and Prevention (CDC): Anthrax, botulism, cyanide, mustard gas, radiological emergencies, ricin, smallpox, VX . Center for Biosecurity of UPMC - Research, analysis, and policy recommendations for decision makers who are responsible for strengthening U.S. planning, response, and resilience to catastrophic events. Center for Disease Control and Prevention (CDC) - The lead U.S. federal agency for protecting the health and safety of people - at home and abroad, providing credible information to enhance health decisions. Center for the Study of Bioterrorism and Emerging Infections (CSBEI) - Conducts research and provides public health and healthcare education and reference materials for biological incident preparedness. Chemical & Biological Weapons Nonproliferation Program (CBWNP) - Researches the proliferation of chemical (including toxin) and biological weapons and develops strategies for halting and reversing their spread. Chemical Materials Agency (CMA) - U.S. Army agency created to enhance the safe storage and elimination of the nation's aging chemical weapons. Chemical Weapons Convention Archive - The Chemical Weapons Convention is one of the 25 core treaties of the United Nations. It is an international treaty which bans the development, production, use, stockpiling, and transfer of chemical weapons. The treaty text contains provisions for verification of the treaty including explicit inspections procedures, lists of banned chemicals, and deadlines for the destruction of declared weapons stockpiles and production facilities. More information about the timeline of the CWC, its accomplishments, Members and Signatories, and First Review Conference is available here or on the OPCW website. Chemical Weapons Facts - Provided by Physicians for Human Rights (PHR) to educate and provide guidance to physicians who may become first responders to a chemical warfare agents attack. Ideally, physicians will study these CWA Fact Sheets in advance of an emergency to understand symptoms of exposure, treatment options, and public health safeguards that can minimize harm in the event of an attack. Chemical Weapons Working Group (CWWG) - A national coalition of more than 200 citizen organizations whose mission is to ensure chemical weapons are destroyed using technologies that are safe for the public and the environment. Committees on Biological Warfare, 1941-1948 - Following a directive from President Franklin D. Roosevelt, Secretary of War Henry L. Stimson in October 1941 called upon the National Academy of Sciences to form a committee to assess the then- current state of knowledge in the field of biological warfare. The W.B.C. ("War Bureau of Consultants") Committee was thus organized by the NAS in November. Initially charged with investigating the possibility that enemies of the United States could use biological agents to attack human, agricultural, and livestock targets, the Committee issued a comprehensive report of its findings in February 1942. It also recommended that a civilian agency look further into the defensive and offensive aspects of biological warfare. With the establishment of that agency - the War Research Service (WRS) - later in 1942, the W.B.C. Committee was disbanded. Convention on the Prohibition of the Development, Production, Stockpiling and Use of Chemical Weapons and on their Destruction (CWC) - Adopted by the Conference on Disarmament (formerly the Conference of the Committee on Disarmament) in Geneva on 3 September 1992. The CWC was the first disarmament agreement negotiated within a multilateral framework that provides for the elimination of an entire category of weapons of mass destruction under universally applied international control. Dark Winter - The Dark Winter exercise portrayed a fictional scenario depicting a covert smallpox attack on U.S. citizens. The scenario is set in three successive National Security Council (NSC) meetings (Segments 1,2 and 3) which take place over a period of 14 days. Former senior government officials played the roles of NSC members responding to the evolving epidemic; representatives from the media were among the observers of these mock NSC meetings and played journalists during the scenario's press conferences (see Players List). The exercise itself was held at Andrews Air Force Base, Washington, D.C., on June 22-23, 2001. Defense Threat Reduction Agency (DTRA) - The U.S. Department of Defense's official Combat Support Agency for countering weapons of mass destruction, addressing the entire spectrum of chemical, biological, radiological, nuclear and high yield explosive threats. Dominion Research Center - Information on biological weapons, chemical weapons, and nuclear weapons. Emerging Infectious Diseases (EID) - A CDC peer-reviewed journal tracking and analyzing disease trends. Evaluation of Demonstration Test Results of Alternative Technologies for Demilitarization of Assembled Chemical Weapons: A Supplemental Review - Discussion of whether various processes [namely, Burns and Roe, General Atomics, and Parsons-AlliedSignal technologies] might be viable for the demilitarization of assembled chemical munitions. FAS Chemical and Biological Arms Control Program - Covers all aspects of chemical and biological weapons and their control, concentrating on efforts to prevent the development and use of biological weapons (BW) and the further proliferation of BW programs. A major focus is the strengthening of the Biological Weapons Convention with a compliance regime and cooperative measures for the prevention of infectious disease. Harvard Sussex Program - A collaboration between faculty at Harvard University in the U.S. and at the University of Sussex in the United Kingdom providing research, publication, other forms of communication, and training in support of informed public policy on chemical/biological warfare (CBW). International Society for Infectious Diseases (ISID) - Committed to improving the care of patients with infectious diseases, the training of clinicians and researchers in infectious diseases and microbiology, and the control of infectious diseases around the world. Iraq Special Weapons - Nuclear, biological, chemical and missile proliferation news presented by the Federation of American Scientists (FAS). MEDLINEplus: Anthrax - Information and resources on anthrax. MEDLINEplus: Biodefense and Terrorism - Resources and health information on biological and chemical weapons, including : latest news, overviews, prevention and screening, specific conditions, and related organiztions. MEDLINEplus: Smallpox - Information and resources on smallpox. Office of Chemical and Biological Weapons (AVC/CBW) - Serves as the lead office within the Department of State to promote the global bans on chemical weapons as embodied in the Chemical Weapons Convention (CWC). Organisation for the Prohibition of Chemical Weapons (OPCW) - OPCW's mission is to implement the provisions of the Chemical Weapons Convention in order to achieve the OPCW's vision of a world free of chemical weapons, and a world in which cooperation in the peaceful uses of chemistry is fostered. In doing this, our ultimate aim is to contribute to international security and stability, general and complete disarmament, and global economic development. Project SHAD - Project SHAD, an acronym for Shipboard Hazard and Defense, was part of a larger effort called Project 112, which was conducted during the 1960s. Project SHAD encompassed tests designed to identify US warships' vulnerabilities to attacks with chemical or biological warfare agents and to develop procedures to respond to such attacks while maintaining a war-fighting capability. Also see Wikipedia article. Ricin - From the castor oil plant Ricinus communis, is a highly toxic, naturally occurring protein. A dose the size of a few grains of table salt can kill an adult human. Also see CDC's Ricin page. SIPRI Chemical & Biological Warfare Studies - A series of studies intended primarily for specialists in the field of CBW arms control and for others whose work would benefit from a deeper understanding of particular CBW matters. Smallpox - Centers for Disease Control and Prevention (CDC) government site providing background on smallpox as a disease, vaccines, vaccination programs, tips for lab handling. Smallpox and Smallpox Vaccination - Articles published in the New England Journal of Medicine. Also see CDC Smallpox Home and CDC Vaccine Basics. Sources, Fate, and Toxicity of Chemical Warfare Agent Degradation Products - Included in this review is an assessment of the formation, environmental fate, and mammalian and ecotoxicity of CW agent degradation products relevant to environmental and occupational health. These parent CW agents include several vesicants: sulfur mustards [undistilled sulfur mustard (H), sulfur mustard (HD), and an HD/agent T mixture (HT)]; nitrogen mustards [ethylbis(2-chloroethyl)amine (HN1), methylbis(2-chloroethyl)amine (HN2), tris(2-chloroethyl)amine (HN3)], and Lewisite; four nerve agents: O-ethyl S-[2-(diisopropylamino)ethyl] methylphosphonothioate (VX), tabun (GA), sarin (GB), and soman (GD); and the blood agent cyanogen chloride. Sulfur Mustard and Distilled Mustard (H) and (HD) - Blister Agents - Mustard agents stored in the unitary stockpile are in ton containers, artillery shells, and other munitions. Stockpiled at Aberdeen Proving Ground, MD; Anniston Army Depot, AL; Blue Grass Army Depot, KY; Pine Bluff, AR; Pueblo Depot Activity, CO; Tooele Army Depot, UT; and Umatilla Depot Activity, OR. HD is a vesicant (blister agent) and alkylating agent producing cytotoxic action on the hematopoietic (blood forming) tissues, which are especially sensitive. The rate of detoxification of HD in the body is very slow, and repeated exposures produce a cumulative effect. The physiological action of HD may be classified as local and systemic. The local action results in conjunctivitis or inflammation of the eyes, erythema which may be followed by blistering or ulceration; inflammation of the nose, throat, trachea, bronchi, and lung tissue. Injuries produced by HD heal much more slowly and are more susceptible to infection than burns of similar intensity produced by physical means or by most other chemicals. Systemic effects of mustard may include malaise, vomiting, and fever, with onset time about the same as that of the skin erythema. With amounts approaching the lethal dose, injury to bone marrow, lymph nodes, and spleen may result. HD has been determined to be a human carcinogen by the International Agency for Research on Cancer. United States Army Medical Research Institute of Chemical Defense (USAMRICD) - Nation's leading science and technology laboratory in the area of medical chemical countermeasures research and development. Sophisticated laboratories located at Aberdeen Proving Ground, Maryland, USAMRICD manage a diversified portfolio of medical chemical warfare agent research projects for the Department of Defense and other Federal Agencies. U.S. Army's Chemical Materials Agency (CMA) - The purpose of CMA is to protect and safely store the nation's aging chemical weapons, while working toward the effective recovery, treatment and ultimate elimination of the nation's chemical warfare materiel and to enhance national security. CMA also provides support to National Defense and the American soldier through its industrial base missions. U.S. Chemical Safety and Hazard Investigation Board (CSB) - Chemical incident data for the U.S.
VX - Nerve Agent - Nerve Agent VX is stored in the unitary stockpile in ton containers, artillery shells, mortar projectiles, rockets, and land mines. Stockpiled in Anniston Army Depot, AL; Blue Grass Army Depot, KY; Newport Army Ammunition Plant, IN; Pine Bluff Arsenal, AR; Tooele Army Depot, UT; and Umatilla Depot Activity, OR. Nerve Agent VX is a persistent, nonvolatile agent that is primarily a liquid exposure hazard to the skin or eyes, although small amounts of VX vapor may be generated under extremely high temperatures. Nerve Agent VX affects the body by blocking the action of the enzyme acetycholinesterase. When this enzyme is blocked, large amounts of the chemical acetylcholine build up at critical places within the nervous system, causing hyperactivity of the body organs stimulated by these nerves. The signs and symptoms of exposure to Nerve Agent VX depend upon the route of exposure and the amount of exposure.